Icicles. 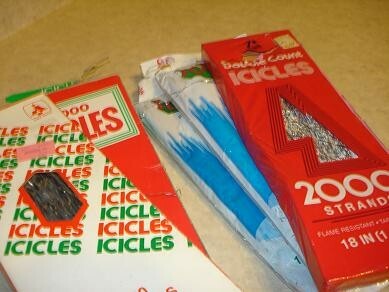 Growing up, my sharpest memory regarding the Christmas season revolves around icicles. Not the frozen sharp eye-threatening weapons that hang from the corners of the gutters, but the shiny tinsel-like icicles that we used to put on our Christmas tree. The ones my mother bought in bulk at Woolworth–usually no less than 25 boxes per year–to ensure that the tree sparkled and twinkled continuously as they reflected the light. As kids we were given a box at a time and instructed to gently pull them from their cardboard fastener and drape them over our hands like a fancy waiter in a a five star restaurant. We were expected to drape each single solitary quarter inch thick strand of aluminum over the branches, ONE AT A TIME with the precision of a surgeon. My father had shown each of us before we could walk the exact way to start at the inside of each branch and, one by one, layer them out to the end where they hung in perfect unison. ‘Make sure they are even’ , he would say. This icicle placement was fun at first. I always felt extremely important and grown-up that my parents allowed me to do this meticulous work. That feeling lasted about two and a half minutes; once I realized that my mother and father were no where in sight, off drinking tea or scotch, while I labored over the task. Every so often they would poke their head in to make sure I was doing it correctly. This was the first time(but not the last) I actually wondered if they had a camera in the living room since every time I tried to put 4 or 5 at a time on the branch in an effort to quicken the process, they would walk in. After what seemed liked hours facing the tree, I looked down at the stack of cellophane wrapped boxes with their windows that displayed the sparkly tinsel, and they seemed to multiply–how could there still be so many to put on? It was growing dark outside and I could smell dinner cooking and I would squint my eyes and watch the icicles sparkle as the lights came on the tree, my waiter-arm feeling heavy; my stomach growling. At some point I needed to go watch Gilligans Island or Bewitched or Rudolph and always abandoned the job after a few boxes. Though I never saw her do it, I am pretty sure my mother would come in and finish the job since the other 23 boxes were always strategically placed before Christmas arrived. Maybe she did what I did when no one was watching and threw handfuls haphazardly at the tree…but somehow I doubt it. As an adult I don’t put icicles on my tree. As far as I know none of my brothers and sisters ever did. We were all a little scarred from this torturous exercise. If you ask my siblings they all roll their eyes in unison remembering the stress put upon us at what should have been a fun and frivolous time–stress put on kids because of their parents control issues. The tree itself was always a control thing for me as well. I had to have the perfect tree. I remember the first year in this house I wanted a bigger tree to accommodate the higher ceilings in my new house and ended up buying a second tree after the first one was up. I made sure the decorating was supervised very closely so that the large bulbs went up top and the homemade ornaments were evenly distributed around the tree. I would re-arrange the decorations when my kids weren’t looking. And so they did a great job. I added a few ornaments when I got home, but I did not rearrange and most importantly I did not criticize. So I woke up the next morning and decided I would incorporate that attitude to the rest of the week and right through Christmas day. And amazingly everything got done–there may have been a little more dust in the corners and the wrapping was a little haphazard, but Christmas came and went anyway. It was a nice christmas, with no yelling or stress and the first year I didn’t throw out my back from tension build-up. If something didn’t get done or wasn’t perfect, well, nobody noticed. What I hope was noticed was a sense of calm and well being that my kids will remember and someday write about. I hope their sharpest Christmas memories are not a meticulous decorating task but rather a warm feeling of holiday spirit. This entry was posted in Uncategorized and tagged christmas, control, family, icicles, memories. Bookmark the permalink. That was great, so perfect the way you explained the angst in getting the tinsel right. I think those who lived tinsel have story. You are such a great mother and Mark a great father, I’m sure your kids will have very calm and loving memories. Happy to hear you had a great Christmas. Many more. hey – great write up – I think I must have drank the same Kool aid as I took a similar path this year – and truth be told our tree is still up! I am still picking up remnants of bow’s and wrapping paper and am like whatever – life won’t end if it’s not all put away or whatever – kind of goes with enjoying the moment!